I was a member of the Men’s Track & Field and Men’s Cross Country teams at Valley City State University before being diagnosed with Hodgkin’s lymphoma. After overcoming the cancer, I wanted to give back by volunteering. 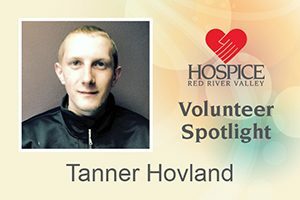 I am a pre-med student, and my Pre-Professionals Club adviser suggested that I volunteer with Hospice of the Red River Valley. My favorite memory is my first match. The experience and patient visits will stay in my mind forever.